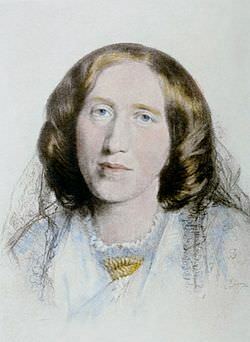 George Eliot once said, “It is never too late to be what you might have been.” Except George Eliot was the pen name for Mary Anne Evans, one of the leading writers of the Victorian era. She is the author of seven novels, including Adam Bede (1859), The Mill on the Floss (1860), Silas Marner (1861), Middlemarch (1872), and Daniel Deronda (1876), most of them set in provincial England and well known for their realism and psychological insight. At the time, female authors were starting to be published under their own names but were widely stereotyped for writing lighthearted romances. Mary Anne used a male pen name, she said, to ensure that her works would be taken seriously, and possibly to prevent scandals related to her relationship with the married George Henry Lewes, with whom she lived for over 20 years. Mary Anne’s father didn’t consider her to be marriage material, so he shipped her to a boarding school with the hopes that she would find a career possessing a higher education degree not typically afforded to women. She gained a zeal for literature, but interestingly, didn’t begin writing until she was 31 years old, and then didn’t publish her first novel until age 40. Several best sellers came forth from George Silas over the next nineteen years, a full career for someone who was written off at childhood at having little chance of success. My guess is that Mary Anne lived life in crescendo from the moment she discovered literature, and that her only regret would have been that she hadn’t discovered her true passion earlier in life. Nonetheless, she is acclaimed to be one of the most significant writers of her era, even if her pen name was that of a man. So if you are currently stalled in an intermission, it’s not too late for you to find your mission too.